When welding stronger steel materials, Hydrogen Assisted Cold Cracking (HACC) is a real problem. HACC is characterized by cracks that form in the weld and/or heat affected zone of the base metal once the weldment reduces temperature. With adequate welding procedures, and care during welding, HACC can largely be eliminated. Cold cracking. Cold cracking refers to the fact that hydrogen cracking only takes place when the weld is relatively cold. Delayed cracking. Hydrogen cracking can be delayed for many hours. Sometimes as long as 72 hours, although that is unusual. Much more typical would be around 12 hours. Onshore Pipeline Tie-In Weld: A typical situation where hydrogen assisted cold cracking can occur. What is Hydrogen Assisted Cold Cracking? There are a number of different mechanisms proposed for hydrogen assisted cold cracking. Given that there are a number of different “theories”, I am sure you can imagine that there is no single accepted mechanism. A widely held theory is that hydrogen atoms diffuse through the metal, and collect at “spaces” in the microstructure of the metal. This would typically be at inclusions in the metal, and at grain boundaries of the metal. Once the atomic hydrogen collects, it transforms to molecular hydrogen (H2) or even reacts with carbon to form methane at these points where it collects. Once the hydrogen is no longer existing as a single atom, it becomes too large to easily diffuse through the metal structure. Over time, more and more hydrogen collects and results in excessive “pressure” at these very localized points. It is argued that the pressure can grow to be so large, that it results in the material “splitting apart”. This splitting apart under the pressure caused by the hydrogen is then seen as hydrogen cracking. There are problems with this theory, when taken in isolation. Another theory is that hydrogen collects around inclusions in the metal, such as carbide inclusions. When the material then experiences a slow plastic deformation, (as may be present when welds shrink as they cool to room temperature) the hydrogen atoms are “dragged along” by moving defects (called dislocations) until the hydrogen atoms effectively pin the dislocations. When this happens, plastic deformation can no longer take place, and the material acts in a brittle manner. It is important to note that ductility in metals is due to the movement of dislocations. If dislocations can no longer move, then there is no longer any ductility. The presence of atomic hydrogen: During arc welding, there is almost always some hydrogen present. Mostly it is derived from moisture or hydrocarbon contamination. The presence of a tensile stress: In the absence of stress, hydrogen cracking does not take place. During welding, there is almost always high stresses present due to the thermal shrinkage of the weld during cooling. Any stress concentrators such as weld defects will tend to increase the stress levels locally. A susceptible microstructure: Certain material structures such as “austenite” (304 and 316 stainless steels are austenitic materials at room temperature) are not susceptible to hydrogen cracking. The most susceptible microstructures are those that are hard and brittle. High strength steels typically have such structures. Hardened welds in carbon and low alloy steels are therefore also susceptible to hydrogen cracking. A low enough temperature: Cracking only takes place below a temperature where the hydrogen does not diffuse quite so readily. Generally, a limit of around 100°C is accepted, although under very adverse conditions hydrogen assisted cold cracking (HACC) can happen at temperatures slightly higher than this. Heat Affected Zone Cold Cracking in Fillet Weld: Incomplete penetration and uneven leg length has increased stresses in the smaller leg. Reduce the level of hydrogen: Some welding processes, such as Gas Tungsten Arc Welding, (GTAW) are inherently low hydrogen. In the case of the fluxing processes such as Shielded Metal Arc Welding, (SMAW – also called stick welding) flux constituents can be formulated to have low moisture contents. This is further enhanced by “baking” the electrodes to drive off as much of the moisture as possible. Apply a relatively high pre-heat to the material to be welded: This generally results in lower cooling rates of the weld and heat affected zone (HAZ) and generally results in a tougher microstructure. Maintain a relatively high inter-pass temperature: If the temperature of the weld and heat affected zone is maintained above about 100°C, for typical structural steels, even during the time between weld runs, then the temperature does not get low enough to allow “cold cracking” to occur. For higher strength steels, the temperature may need to be increased to 150°C. Apply a post-heat: In this method, a high pre-heat and interpass temperature is maintained during welding. Once welding is completed, the temperature is still maintained for a period of time. This is called a “post heat”. During this post heat, the offending hydrogen is given time to “bake out” of the material, reducing the levels of hydrogen available to result in hydrogen cracking. Maintain a high heat input when welding: A high heat input is just another way of saying that the amount of energy applied while welding, is high. Heat input is generally measured as the voltage times the amperage, divided by the welding travel speed. A high heat input generally results in slower cooling rates, which generally results in more ductile microstructures. In addition, there is a slightly longer time at an elevated temperature, which allows more hydrogen to “bake out” before the temperature gets low enough to allow cold cracking to occur. Use a material that is unlikely to form hard, brittle microstructures: Typically this is done by using materials with low carbon equivalents. Modern steel mills manage to obtain high material strengths with low carbon equivalents, by using the thermo-mechanically controlled process (TMCP) when rolling the steel to final shape. Use a filler metal that is weaker than the parent metal being welded: If the weld metal is significantly weaker than the base metal, and it is very ductile, then when the weld is stressed, the plastic deformation will largely be limited to the weld metal and not the base metal. As the weld metal does not have a susceptible microstructure, hydrogen cracking would be unlikely. Obviously this does mean that the weld is weaker than the base metal, so the weld does not take full advantage of the material strength. To overcome this, the weaker weld metal is typically only used for one or two weld runs, and the rest of the weld runs are made with over-matching filler metal. This works, because hydrogen cracking is most prevalent in the weld while the cross section is small. Once the weld becomes “thick enough”, it experiences much less plastic deformation when exposed to thermal stresses, so the probability of hydrogen cracking is reduced. 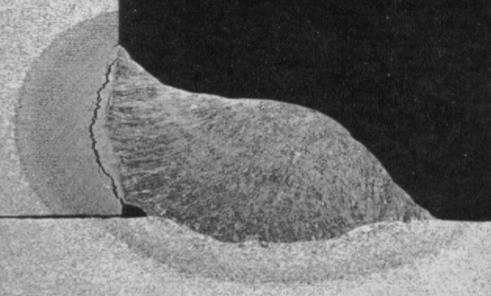 Ensure that the time delay between weld runs is minimized: As hydrogen cracking tends to be a time dependent mechanism, the probability of cracking can be reduced by ensuring that the next weld run, which will then raise the weld temperature again, is placed before the weld has had enough time to cool down, and for the hydrogen to accumulate around inclusions in the material. The most critical time delay is between the first and second weld runs. For this reason, the second weld run is often termed a “hot pass”. The idea being that this pass needs to be deposited as soon as possible, while the weld is still “hot”. This hot pass also acts to heat the weld back up to a temperature above which the hydrogen can be “baked out” of the weld. As a general rule, if the time from the start of the root pass, to the start of the hot pass can be kept to less than 8 minutes, then hydrogen cracking is unlikely. Sometimes this is achieved by having more than one welder welding on a weld at a time. Use of an austenitic filler metal: This is unusual, but works well if there are no problems with the use of an austenitic weld metal. This works because the austenitic weld metal can “dissolve” all the hydrogen that will realistically be generated during welding. This means that there is not much of a driving force for pushing the hydrogen into the base metal, therefore hydrogen cracking is unlikely. Unfortunately there are a number of disadvantages to this. The first is that typical 300 series weld metals are weaker than high strength steels, so you need to use high nickel content austenitic fillers for strength matching. These fillers are expensive. Typical 300 series stainless steel materials are also susceptible to stress corrosion cracking in certain environments, so they would not be suitable for those applications. Another problem is galvanic corrosion that can be experienced when carbon steels and corrosion resistant alloys are in contact in a corrosive environment. Reduce the applied stresses on the weld as far as possible, until you have managed to deposit a relatively thick weld cross section: As an example, when performing pipeline welding, the alignment clamps holding the joint together are not removed until most of the weld has been deposited. Another example is to ensure the best fit-up possible between pipe ends when welding. The worse the fit-up, the greater the stresses that the weld experiences, especially in the root region of the weld. Another example is to complete welding before moving the weld joint. If the pipe is re-positioned when only the root run has been deposited, then the stresses my be high enough to result in hydrogen cracking. 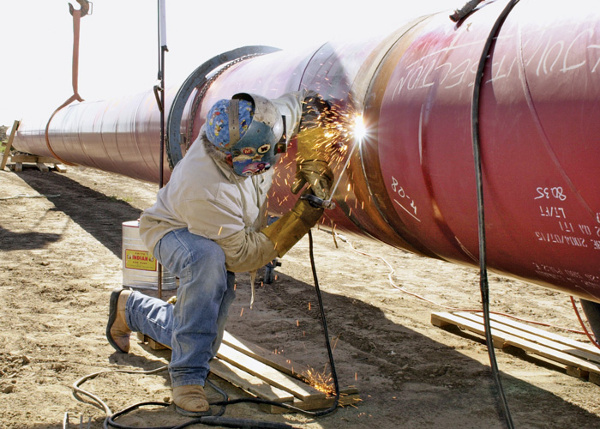 When laying cross country pipelines, there are typically thousands of welds required. Under these circumstances high productivity welding techniques are important. A 10% time saving, when doing so many welds, are very advantageous from an economic perspective. 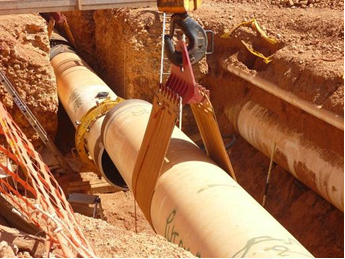 One of the traditional ways of achieving high production rates when welding on these pipelines, is to use cellulosic electrodes with the Shielded Metal Arc Welding (SMAW) process. While most mainline pipeline welds are done with automated welding these days, a lot of pipeline projects still use cellulosic electrodes for the “tie-in” welds. The reason is that cellulosic electrodes have a very penetrating arc, so they are well suited to performing root runs on pipes. The slag is also quick freezing, allowing a vertical down welding progression to be used. This further increases the welding speed and productivity. Pipeline Welding With Cellulosic SMAW Electrodes: This situation is one of the most susceptible to Hydrogen Assisted Cold Cracking. The big problem with cellulosic electrodes is that they rely on moisture in the flux coating to provide these advantages. By design then, cellulosic electrodes result in high amounts of hydrogen being present. It must be accepted that when welding with cellulosic electrodes there is always enough hydrogen present to result in hydrogen cracking if all the other factors are also present. In addition to high welding productivity, pipeline economics tend to favor the use of high strength pipeline steels. (Then the pipeline can be thinner.) Such high strength steels are typically more prone to hydrogen cracking than lower strength steels would be. Due to this combination of high strength steels being welded with high hydrogen welding methods, hydrogen assisted cold cracking (HACC) is a big focus on pipeline projects. In fact, most cross country pipeline codes have a high focus on welding variables that can result in hydrogen cracking. For this reason these welding codes tend to have a lot of essential variables that are not addressed in other welding codes. It is also important to note that most modern pipeline steels are Thermo-Mechanically Controlled Process (TMCP) steels, which increases the steels’ resistance to hydrogen cracking. It is important to note that these days there are alternatives to using cellulosic electrodes, but often the specific economics of a pipeline project may still push the project engineers to use cellulosic electrodes. In the case of sub-sea pipelines the use of cellulosic electrodes are usually not allowed. This is because time delays are normally specified between a weld being completed and the start of non destructive testing, (NDT) when welding with a high hydrogen welding process. Typical minimum time delays between completing the weld and commencing the NDT would be 48 hours when using cellulosic electrodes. This is done because it allows enough time to make sure that if hydrogen assisted cold cracking (HACC) is going to occur, that it does in fact occur before the testing is performed. When welding on a lay barge, such time delays would add huge costs to the pipelay operation. Technically and economically the use of cellulosic electrodes is therefore just not feasible. Welding Technology Institute of Australia (WTIA) Technical note 1. Australian Standard for the welding of pipelines for gas and liquid petroleum, AS/NZS 2885.2, Appendix E.
American Welding Society structural welding code AWS D1.1, Annexure H.
European Standard for welding recommendations for welding ferritic steels, EN 1011-2 Annexure C.
Besides the standards referenced above, there are many books that deal with the welding of steels without hydrogen cracking, but the use of one of the standards above will probably be sufficient for most circumstances.